Each year whenever storms hit the Roanoke Valley, they bring the potential danger of rising water levels in our streams and rivers. Most of the flooding is caused by flash flooding. Flash flooding occurs when natural and engineered drainage courses overflow, causing serious flooding in a short time. 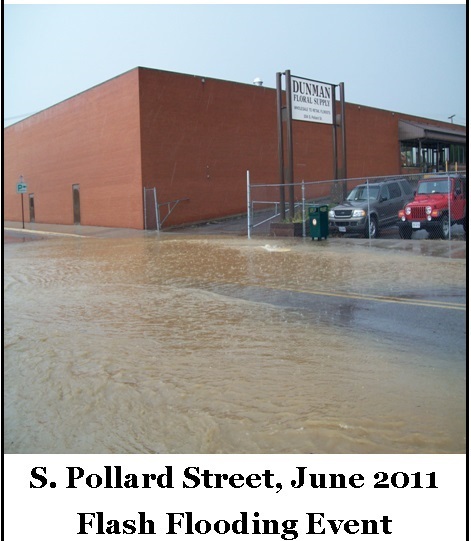 The storm water can flood buildings, yards, bridges, and streets. There is also the possibility of longer term flooding such as the flood the area experience in November 1985. BE AWARE OF FLOOD WARNINGS. When there is a threat of flooding, listen to local radio and television stations for advice. DO NOT WALK THROUGH FLOWING WATER. Water is very swift and powerful and can easily knock you down. Even six inches of water can be dangerous. WATCH CHILDREN CLOSELY. 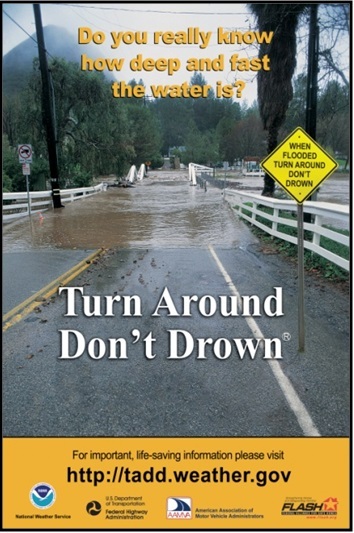 Do not allow children near flood waters, stormwater ponds, storm drains, ditches, or culverts. DO NOT DRIVE THROUGH FLOWING WATER. "Turn Around, Don't Drown!" Many people drown in their cars as they are swept away by currents, which are too dangerous to cross. Watch for road barriers indicating that roads or bridges are closed. IF YOUR VEHICLE STALLS IN HIGH WATER, LEAVE YOUR VEHICLE. Immediately evacuate your vehicle and proceed to high ground. STAY AWAY FROM POWER LINES. Electrical current can move rapidly through water and cause a tragedy. Report downed wires to American Electric Power (AEP) at (540) 985-2727. BE AWARE OF THE DANGERS OF ELECTRICITY. Have AEP turn your home electricity off and unplug all electrical appliances. SHUT OFF WATER AND GAS SERVICES TO YOUR HOME. This will help to alleviate more extensive damage to your home and make cleaning up faster. BE CAUTIOUS. Upon returning to your home, be alert for gas leaks, any debris that may have been left in your house, and wild animals that may have sought shelter during the flood. CLEAN EVERYTHING THAT GOT WET. Flood waters become contaminated by sewage and chemicals and may be a health hazard. If an item cannot be cleaned, throw it away. TAKE CARE OF YOURSELF. Anxiety, stress, and fatigue can take a toll on your family while recovering from a flood. Read “Repairing Your Flooded Home” from the American Red Cross and FEMA for tips on caring for yourself and your family during this time.